So last night I was out, heading with some girlfriends to the J-Lo concert, via a cocktail party (great idea!) and Daniel was home with the kids. Daniel was having a spectacle of his own. Daniel pulled up his blind, told him he could look out, play with his toys but he had to stay in his room and sleep in his bed. He kicked up a fuss but Daniel left him to it. When I got home Daniel informed me of the behaviour, I cringed and thought he needs a talking to in the morning. 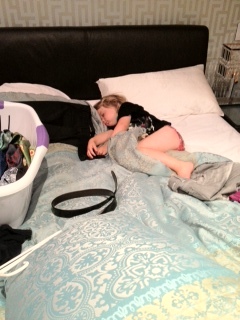 I went upstairs to get changed and found this…. We moved him back to his and he didn’t wake up. In the morning the cheeky monkey was more than happy to regale the story of how he slept in our bed and Daddy didn’t know. I need to come up with some better answers and I am writing this to keep track of my lies…. Santa might not get me any presents this year if he finds out.